Underwater archaeologists in Italy have discovered the wrecks of five ancient Roman ships in the Mediterranean, with their cargo still largely intact. The ships are lying in up to 150 metres (500 feet) of water off the tiny island of Ventotene, between Rome and Naples. They are between 1,600 and 1,900 years old, and were laden with - among other things - jars for carrying wine, olive oil and fish sauce. One expert said: "It is like an underwater museum." 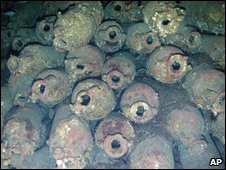 Also on board were kitchen tools, and certain metal and glass objects which have not yet been identified. The discovery of wrecked ships is not unusual - there are said to be thousands dotted around the Mediterranean. 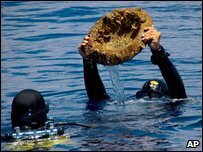 But Annalisa Zarattini, from the Italian Culture Ministry, said the latest to be found are much better preserved than usual because they sank in deeper water, which protected them from destructive currents. The ships also sank without capsizing, she said, allowing examination of the cargo in almost the form it had been loaded. Officials say the latest finds are the result of a new drive by archaeologists to scan deeper waters, organised by the culture ministry and the Aurora Trust, a maritime research group. The plan was prompted in part by a desire to prevent the looting of treasures. Because of improving technology, looters are now able to dive to greater depths than in the past. "It's important that we arrive there first," said Ms Zarattini. The team of archaeologists and deep sea divers used sonar technology and miniature robotic submarines in their latest operation. The biggest of the ships discovered is about 20 metres long (60 feet). The area they were found in was on a major route for trade between Rome and its North African territories. Some of the objects are being put on display on Ventotene.